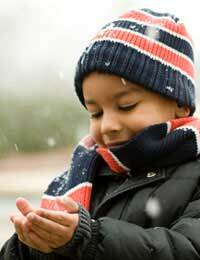 Home > Ask Our Experts > Can it Be Too Cold For Children to Play Outside? Is it ever too cold in England for children to play outdoors? Should a child having a cold or sniffle stop them playing outdoors? Also if a child has wet hair should they dry it before going out in cold weather? Provided children are wrapped up warmly with suitable clothes that will keep them dry, they should be able to play out in all temperatures in the UK. Make sure they wear layers so that they can avoid getting overheated as they play, and change their socks and gloves if they get too wet. Avoid gaps in their clothes – for example between their trousers and socks or between their tops and trousers. If the skin on their tummies gets gold to the touch, or their balance seems to be a bit shaky, they are getting too cold and should come in, at least until they warm up. Have hot drinks and dry warm clothes waiting for them inside and use a baby moisturiser to prevent or treat chapped skin on faces, hands and lips. Children cannot catch a cold by being out in the cold – actually being outside might protect them from colds, as the viruses are more likely to pass from child to child when they are all kept inside. Parents can also enjoy playing outside with the children (not just standing and watching) – the extra exercise is always good and if the parents are getting too cold even when moving about energetically, the children will be too. If a child with a cold or sniffle is feeling well enough, they can still play outside, provided they are kept warm and dry. They should have plenty of fluids to drink, and should avoid getting too over-tired, too hot or too cold. They are less likely to pass the cold onto their friends when they are playing outside than when they are playing close together inside. Also, if a child has wet hair should they dry it before going out in cold weather? Going out with wet hair won’t make a child catch a cold – only catching a virus causes colds. However, on very cold days, wet hair (unless it’s covered up with a hat) might make the child feel colder, which isn’t very comfortable.